The author mentioned she had browsed our web page, yet the résumé was address "to whom it may concern". If she had browsed our web page, she could easily have found the names of the partners of our company: sending your résumé to a specific person, instead than to nobody in particular, increases the chance that it will be read. The author said in the subject of her e-mail she was an English to Spanish translator, but she did not include that information in the header of the résumé. Without that information, it is impossible to see at a glance what exactly you do. The résumé was in Spanish, though it was sent to a company based in the United States. As it happens, I do read Spanish, but if I did not, the résumé would have been sent to a person unable to read it. Tailor the language of your résumé to the language or languages of the country you are sending it to. The résumé included work experience not relevant to our profession, such as teacher of English or education coordinator. Only include information that is relevant to the position you seek. The résumé listed first educational attainments, and only afterwards professional experience. Also, it was in chronological order, with older items first. Your résumé should follow the most commonly used format for your target country. For the USA, you should mention your professional experience first, your educational experience only later. Also, you should list your professional experience in reverse chronological order (most recent first). The résumé was much too long (seven pages). One page (two maximum for experienced professionals) is usually more than enough: busy people don't want to wade through seven pages of repetitious information. Be short and to the point. The résumé listed as working language pairs both English into Spanish and Spanish into English. Unless you are truly bilingual (raised as bilingual from an early age), you should give as your target language only your own native language. While the résumé listed as working languages English and Spanish, under "Languages" it only gave French language courses. If a language is not among the languages you translate, do not mention it in your résumé. The résumé had a "hardware and software" section, which may be useful, but then included irrelevant information. Tell the CAT tools and other specialized tools you use (so, do include Trados, Acrobat professional and Auto-CAD, if you have them). Do not include programs that everybody is expected to have (Windows, Office), or outdated software (Adobe 4 when the current version is 9). If you do not use the latest version of some program, it is better to blur the issue a bit, by not mentioning the version number at all. The résumé had a three-page list of translations done. Much more useful is a brief summary that suggests the fields you have translated in (for example, "Translated for customer X medical documents and articles, as well as various magazine articles for customer Y"). 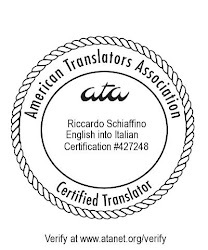 A long list of translations is usually counterproductive for two reasons: a) it will not be read, and, b) it gives the impression to be a complete list of all the translations ever done, thus evidence of a relative lack of experience. Finally, the résumé had a list of further education courses, none of which had any relevance to translation (at first glance they seem all to be courses for teachers). If something does not add to your professional experience or attainments, do not include it. If you include something, explain why it makes you a better translator. This résumé managed not to fall into a couple of frequent errors: it did not include personal information (such as date of birth or marital status), and it did not include a photograph (both no-no's for a résumé aimed at a US prospect). It is difficult enough to win new customers by sending out a good résumé. Sending one that hides your true accomplishments and looks amateurish further stacks the deck against you. For more Dos and Don’ts about translators’ résumés, download my article “How Not to Get Hired”. Agree with most of your points, I even deleted one of my secondary languages from my CV after considering one of your points. But actually, if this is all that is wrong with a CV that puts it among the better ones! I get very irritated when people claim to be prodificient in Word yet line up the columns in their CV using spaces, and other such horrors. Regarding the point about only including job experience related to the position sought, I would say that I WOULD appreciate quite a wide range of information, as I like to see that the translator is well versed in a variety of areas. That's why I like to see hobbies and interests too - we want our translator to have a wide knowledge from many areas. I am worried when all someone is interested in is translating legal texts for the European Union! Good points about the layout and additional information. I think, however, that information about hobbies, other interests, etc. (e.g., publications) should be in a section of its own, after the work and educational experience. To me, when the professional experience mostly consists of things that have nothing to do with translation, it only gives the impression of someone with very little actual translation experience. I must agree with Mark. I am a translator for Brazilian Portuguese and have been hired by many customers because of my previous experience in many areas.